Me: Kids, I'm your Mummy! This is the conversation that frequently happens in the back of my car to and from the nursery. For some strange reason my kids are obsessed with how many ‘best friends’ they have in their lives. I'm not entirely sure they really understand what they’re saying. However, despite their age they’re already recognising the importance of having allies in their life. Folks they can lean on, talk to and build a relationship with…much the same as we do in business. There has been a lot of reference to the increasingly strong alliance between the CMO and the CIO – largely because marketing will become one of the largest technology investors within a business. This is because marketing holds data…BIG DATA…and the need to analyse and predict consumer behaviour in this digital world is more important than ever. However, there’s another relationship that I believe is overlooked. 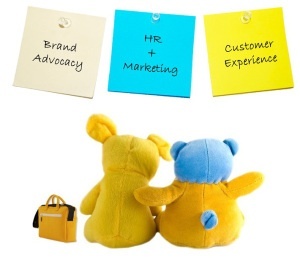 The one between HR and Marketing. Brand management traditionally sits in the marketing function and managing the Employer Brand (the one that attracts talent to the organisation) sits with HR and/or Employee Communications. An engaged workforce is a great thing to have. An achievement in itself. But a socially active engaged workforce has the potential to become your biggest marketing asset and quite possibly the strongest competitive advantage an organisation can have – an opportunity that I believe many CMOs are overlooking. Training your employees to understand the brand values and empowering them to live those values within their role is probably the best thing you can do to humanize the brand and keep it authentic. I called Amazon a few weeks ago after a baby camera I bought stopped working just months after purchasing it. The chap was clearly empowered to act – he didn't have to put me on hold, ask his manager for permission or call me back. He simply said “Sorry about that Madam, you’ll get another in the post and because we realise these kind of products are important when you have small kids, we will post it on ‘next day’ delivery service”. Now that makes for a great customer experience! Not only was this guy pleasant to talk to, he was empowered to act to a point that exceeded my expectations. Thank you Amazon! There is an emerging trend within marketing to own the end-to-end customer experience. This customer experience is defined by every touch point a business makes with a prospective buyer. Every interaction a person has with a business - whether via online chat, a phone call or even just driving up the motorway and seeing a branded vehicle – defines their experience and perception of the business. A lot of that customer experience is created by the very people working for your company. It is essential they advocate the brand values and are engaged in the business. 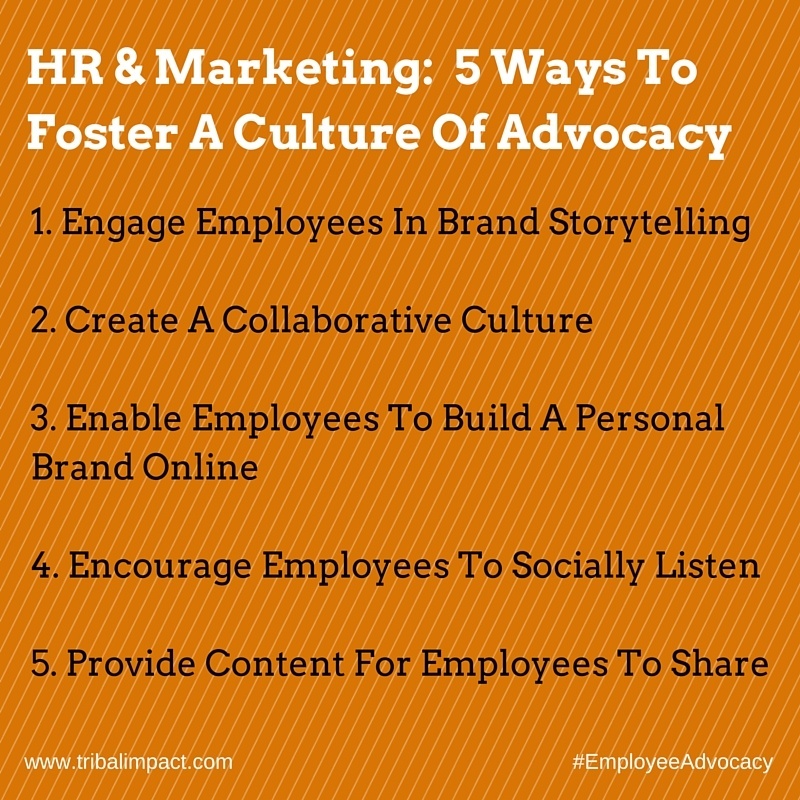 So how do you foster a culture of advocacy in an organisation? Engage Employees In Brand Storytelling: Don’t just list the values on a poster near the coffee machine. Encourage employees to live the brand values. One thing SAP did brilliantly is to encourage employees to bring their personality to work. Our tagline at the time was about helping businesses to “Run Better” so we ran an internal campaign called “What makes you run?” It immediately humanises the workforce. The chap sitting opposite for 3 years is a keen skydiver, the woman in the IT department is an adrenaline junkie and the guy in the pre-sales team bakes amazing cakes! It’s about bringing personality back into business. Enable Employees To Build A Personal Brand Online: If you have a social culture within the business it’s easier to transition employees to networking outside the business. Confidence is built internally and a portion of your employees will be curious enough to build a personal brand outside the business. Help them! It’s good for them because they feel the company is investing in their personal brand and development. It’s good the business because you get to showcase your socially savvy talent in a professional light. Potential customers are more likely to connect to people than to logos. Encourage Them To Socially Listen: Show employees how they can find conversations online and how to engage with others. Listening is the most powerful social skill any professional can have. It allows employees to stay up to date with the latest news and research in their field of work. It also opens doors for them to build their network and meet like-minded professionals who they can exchange ideas and learn from. You’re fostering a learning culture with your employees when you teach them to socially listen. Provide content for them to share: In my experience the biggest factor stopping employees getting socially active online is the fear of sharing something that will get them into trouble. Make it easy for those stepping into social sharing by giving them content to share. 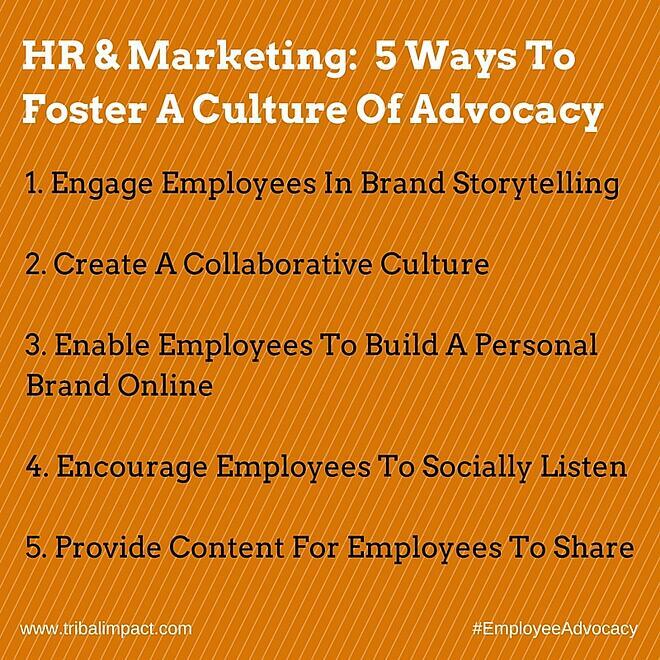 There are some great tools out there to help this process along – I’ve used Dynamic Signal and it’s the perfect solution to get your employees active with content they know is socially ready to share and endorsed by the brand. In the coming years you will read a lot about customer advocacy and encouraging CUSTOMERS to advocate on behalf of the brand. My suggestion is to start a little closer to home. Your employees should have some engagement with your business…they’re working for you right? They should understand the brand better than any other part of your business ecosystem. It’s time for HR and Marketing to become new #BFFs to enhance your customer experience!